Life in the Clouds: Escuelas Saludables! Today Nicole, Julie and I attended an “escuelas saludables” (healthy schools) event in San Marcos La Laguna. 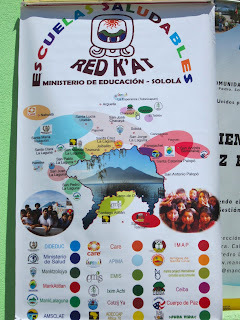 The initiative, led by the Ministry of Education as well as a network of twenty NGOs and local community-based organizations, aims to certify schools across Guatemala as “healthy schools” based on specific criteria including sufficient education surrounding nutrition and hygienic practices, environmental appreciation, the implementation of recycling, composting and proper trash disposal as well as adequate infrastructure, among other things. Today’s event was a chance for the network of people and organizations working toward this goal to come together, celebrate the project, and receive the official healthy schools manual which provides relevant information regarding the purpose of the initiative as well as what the schools can do to reach this goal. These manuals will be distributed to every teacher working at a school which is part of the project. A pannel of important leaders shared a few words about the importance Escuelas Saludables. Many of the organizations set up tables so we could learn about one another. I learned about the initiative a few months ago from a friend who works with the Mancomunidad La Laguna, an association of governmental and non-governmental people and resources around Lake Atitlan who work to improve environmental, health and economic conditions of surrounding communities. Luckily we made this connection in order to become part of the initiative, because otherwise it can be difficult for schools from rural communities to gain access and information to such projects. This past week Nicole and Julie began the first step of the process by administering a diagnosis of the two primary schools we work with in Central and Cooperativa. Once the diagnosis has been analyzed, we will be able to see what gaps exist in the school’s current activities, resources and infrastructure in order for them to meet the criteria of a healthy school. From there we can begin planning how to support the schools to reach the certification by implementing more health programs, seeking outside funding and collaborating with other organizations to create access to a healthy school and environment for the schoolchildren and teachers of Chaquijyá. The first project we will be working on which relates directly to the initiative is creating a community garden for the school of Cooperativa. We have made contact with another local NGO, Ceiba, who has already been planning to create a community garden for the school in Cooperativa. Our first Spring break group, Vanderbilt, will be working side by side with Ceiba and students from the Cooperativa school to begin creating a garden which can eventually be used to teach schoolchildren about nutrition. It’s amazing to see how interconnected our efforts and goals are with other local NGOs and the government, and as we know, working together we are able to accomplish so much more.